For the next few weeks I’m working my way through a massive bulk lot, filled with bulk LEGO and around 80 sets. I’m planning on building them all, giving them a quick review, and telling you all about the interesting parts I find. You can read Part 5 here. ​This week I finished off the last Aqua Raiders set, and finished a set I’ve been wanting to build ever since coming out of my Dark Ages! It’s been a good week. This set includes plenty of elements that are still only available in this set. 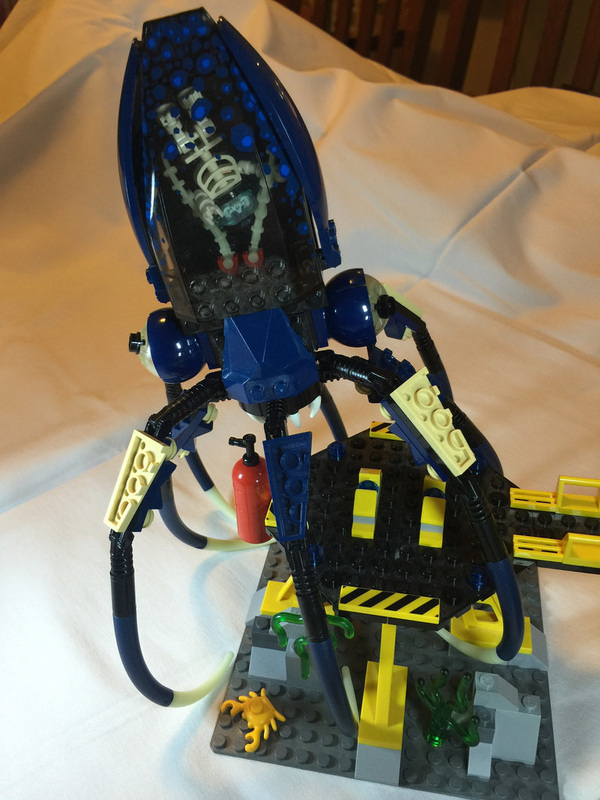 That’s thanks to the octopus, and the windows of the base – the big wide windows as well as the two at the top are unique, as well as many parts of the octopus including the legs, transparent head, earth blue head sides, and eye sockets. The corrugated pipe in yellow is also unique, and although I had a missing one, it’s still great to get six in a set. This build is chock full of unique parts, with around 30 individual elements only being found in less than 10 other sets. It’s a brilliant score! From different shaped windows, to weapons, minifigures and more, it’s one of the best I’ve seen, which is why it gets a perfect 10. Let’s start with the base itself. The big play feature is the release slide. The little submarine thing sits on the hinged platform at the top, and when it’s lifted up, the sub slides down the ramp to the bottom. 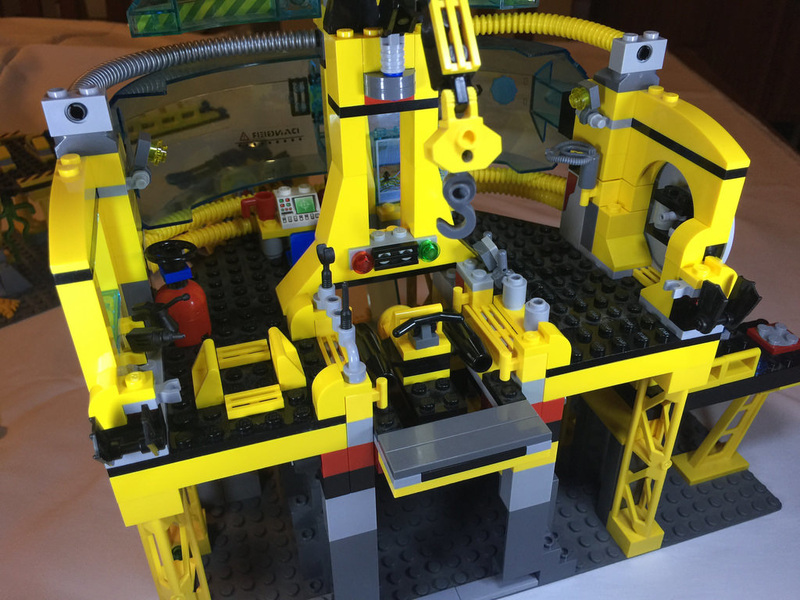 It’s a great play element that adds some unique parts, and is great fun to play with. Next up is the side platform for the bigger submarine – it’s on a swivel, so can be positioned at different angels, there’s also the two big harpoon cannons at the front of the base, the big mounted one at the top of the base, and the crane to lift the submarine in place. There’s plenty to play with! Then there’s that octopus. It’s legs are positionable in lots of different positions, so it can attack in many ways. This set is incredibly playable. I only with there was a way to get more things inside it’s head. If it could actually eat people, then it would get a perfect 10. Either way, it’s a great set. I didn’t have any paper instructions to put it together with, so I had to download them off the internet, so the colours were tricky to pick sometimes (greys and blacks look quite similar), but it got there. After building the little submarines (which doesn’t take too long – they’re pretty simple) the octopus is put together. As with anything with multiple legs, it gets a bit repetitive, but building it is still great fun. The head is fantastic to put together, and when it’s done, it looks very imposing. The base is done in two stages – the side platform first, followed by the main build. It’s got some clever techniques, but nothing we haven’t seen before. Nonetheless, it’s brilliant seeing it rise off the baseplate, and adding the weaponry and windows really makes it shine. The way the big door at the left has been put together is simple, but really effective. That octopus is incredible. I didn’t even notice the skeleton in his head! That is a fantastic feature, and seeing the beast at night is even better, as the tips of the legs glow, as well as two spiked tails in the head. It looks pretty creepy actually. The teeth and the big bulgy eyes are incredible. This is definitely my favourite creature of the whole theme, and possibly the best brick built creature I’ve seen ever. I’m really impressed. The base looks great, and there are plenty of details to gawk over, but I kind of wish it looked a bit more sealed. It’s underwater after all! The big door at the left and the slide I mentioned earlier are brilliant additions. 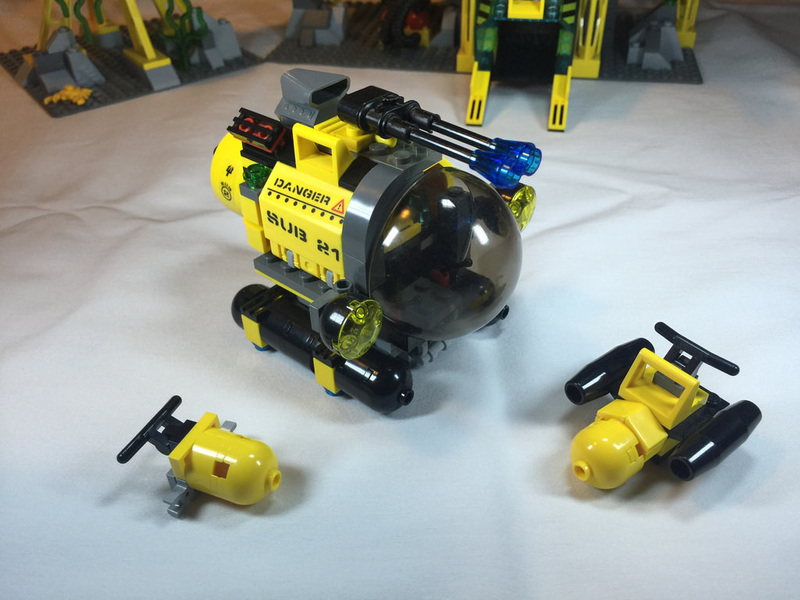 This will look great on a display shelf with the rest of the theme, as well as the 2015 Deep Sea Explorers subtheme. It’s very exciting. To round out the theme, this is a must. It’s the final puzzle piece, and a great looking set. It’s pretty well priced on the second hand markets, sitting at around the $80 mark for used, and $130 for new. The current prices for sale are a bit more, but there are plenty of options. For the elements you get, it’s a steal. You’d be mad to miss it. Whoa, this is a high rating set, and it’s definitely worth it. It’s got some great playability, excellent parts that are still unique or rare, and it’s got that LEGO wow factor. 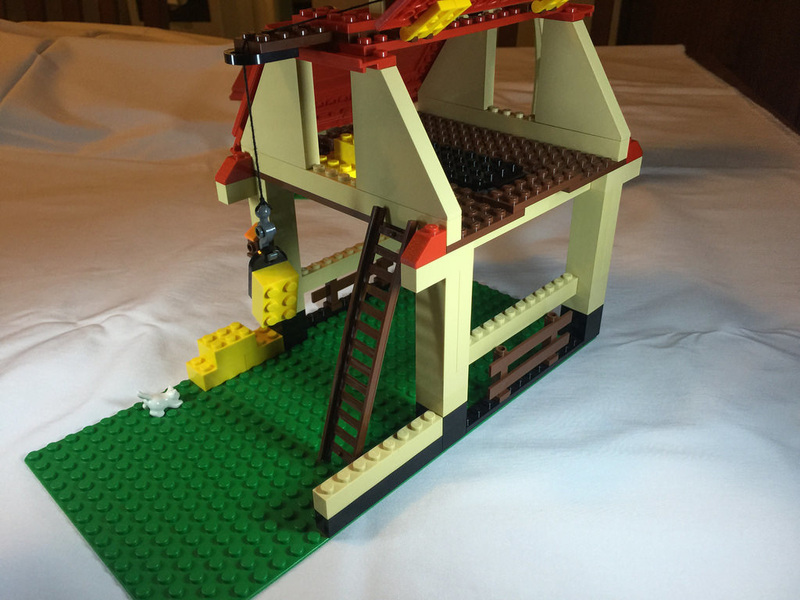 After coming out of my Dark Ages, I was browsing Brickset when I came across this. I instantly thought “That’s a great looking set! What city is complete without a farm!”. I’ve kept an eye out for a copy, but never came across one. Until now! When I saw the list in the bulk lot, I got very excited about it! There are some pretty awesome parts in the Farm, many of which are very big! 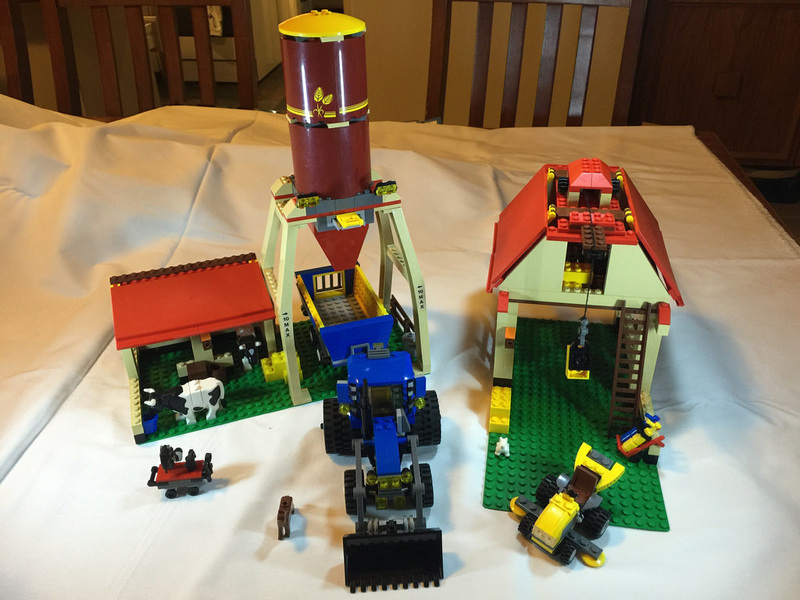 There’s the silo scaffold, the red 8×16 tiles, the 6×16 red plate, those bright red inverted windscreens that form the funnel, the big roof tiles in brick yellow, and the cows! The silo is also pretty great, although I had a missing one, so it’s not 100% complete. The farmer’s tools are always great to have. The minifigures (although I haven’t found them yet) are nice, with the farmer, a workman (handyman type bloke), and another lady. I’m not sure whether she’s a vet or the farmer’s wife. Who knows. There is also the animals – two cows, a dog, cat and mouse. No farm is complete without animals everywhere! 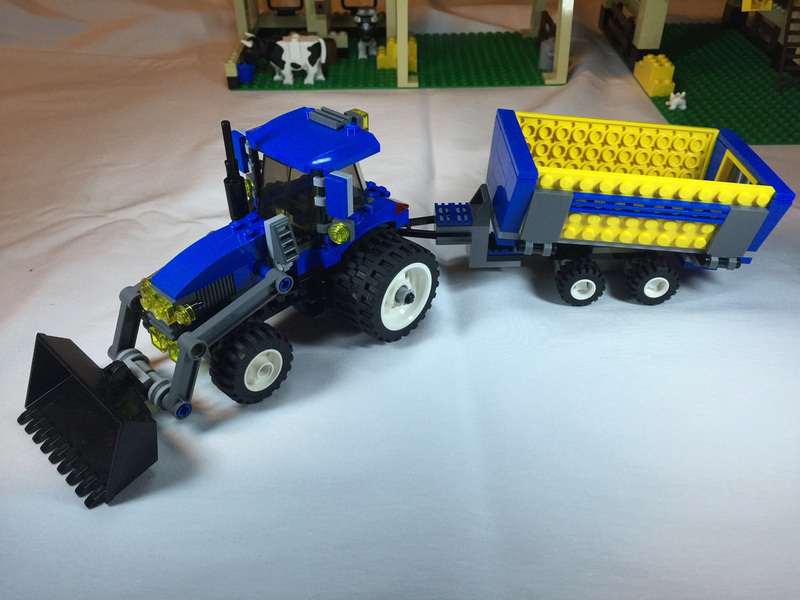 There is a good amount of playability in the set, with the animal stable, the silo which can be filled and drop grain into the trailer, the trailer itself which is tippable (although it doesn’t drain that well), the tractor, the lawnmower, and the barn. The crane on the barn is a nice touch. 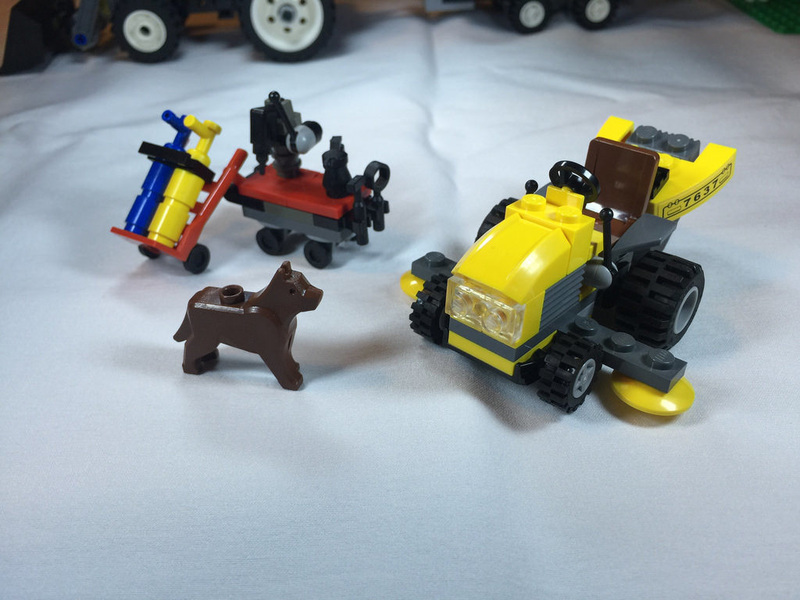 the vehicles in the set are the heroes though – they are really great to look at. Each roof opens up to allow for more play, which is great. Due to the large parts in the set, it comes together pretty quickly. The cylinder and trolley are put together first, followed by the tool trolley. I really wish the 2×2 red tile was a 2×2 jumper plate instead, as the oil can just sits on top, and falls off all the time. The other vehicles come together pretty quickly – nothing new in techniques here. The buildings start with the stable, and then the silo. It comes together pretty quick, but looks great. I was a little disappointed with the barn. Sure, it looks great, but the big roof tiles should have been brick built, not one big angular piece. The ride-on mower is brilliant, and looks great. I’ll be using that in MOCs to come for sure. It’s a brilliant vehicle that looks really effective. The tractor is superb. It has lots of detail, the big doublewide wheels are excellent, and it is one of the nicest tractors I’ve seen. The trailer is a little flimsy, but it looks good. The silo is brilliant, although I wonder if they drop the grain in by helicopter? The stable looks nice, and is a good size for only two cows. The barn looks like a barn I’ve seen before, but the ladder goes nowhere. I’m not sure why it’s there loose. It should be built in underneath. There are not many farm related sets in City (although there are plenty in Duplo), and none of this calibre, so having this set is a must if you really want to have all aspects of city life in your displays. Of course, if you have 7636: Combine Harvester, 7634: Tractor or 7684: Pig Farm & Tractor, then this set is a must get, and should be collected. That’s what drives this score up. What brings it down is the value for money. Due to the big pieces, the element size goes down. For 609 pieces, a price tag of around $140 is a bit much in my opinion, and that’s with the used sets. For a new version, you’ll be hitting over $200 easy. The value for money is pretty low, but collectibility is high. This will be a set that you buy for pure want factor. “I want that set, therefore, I’m happy to fork out the extra cash”, or “it will look great in my display, so it’s worth it”. I’d be happy with the used value, but not much more. It’s a unique set that has some great points, and some that are a little disappointing, but it doesn’t change the fact that it would look great in a big display. 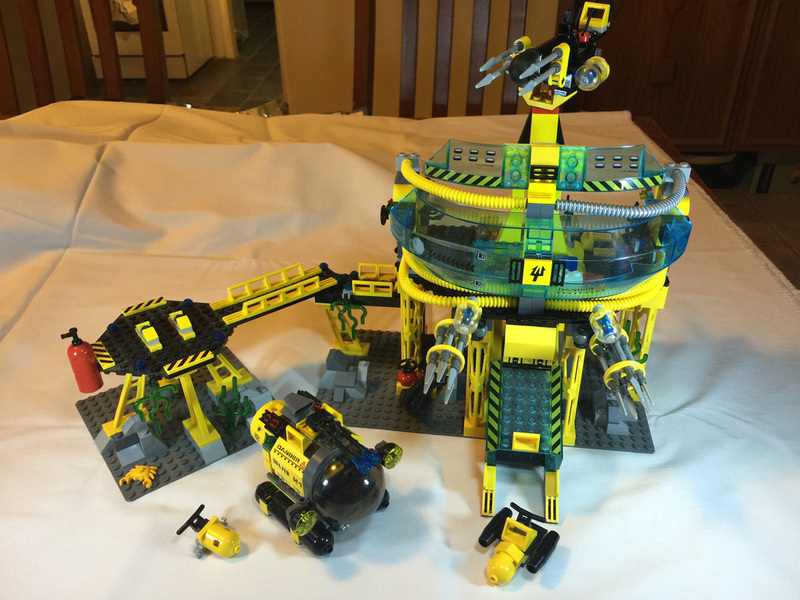 I still think it’s one of my favourite sets that I’ve built. The good certainly outweighs the bad. That’s it for this week. I’ve realised I won’t be able to review all the sets I build, so I’m going to be picking out the unique ones and going from there. I’m still a long way off finishing the project, having built 21 of the 90 odd sets, so there’s a lot to go, but we’re getting there. The biggest job is sorting through the massive piles of colours to find the right part. I’m pulling out the hard to find small parts as I go, but there are still plenty I haven’t found. It’s a big job, but it’s fun, and I get to build some pretty great sets! I guess that’s the whole fun of LEGO. It’s why we love the little plastic bricks so much.